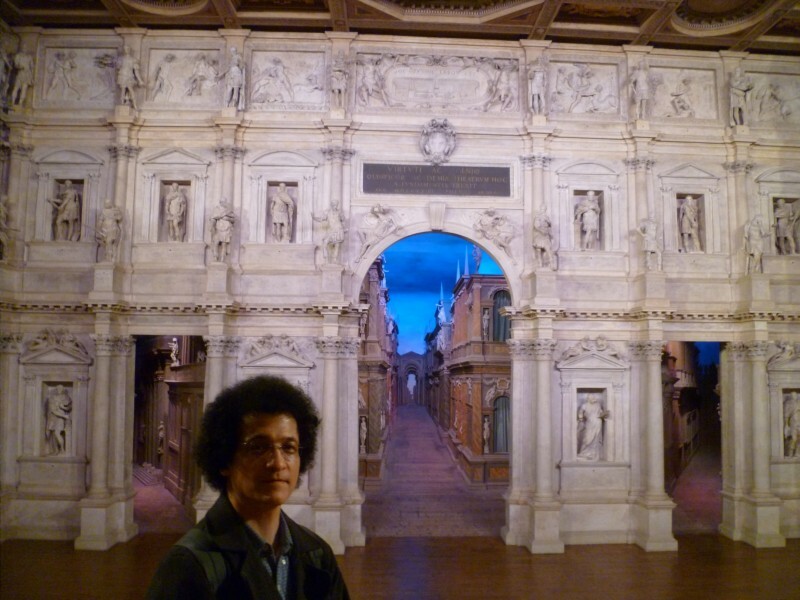 Palladio’s Teatro Olimpico: classic geeks, architecture nerds and trompe-l’œil freaks hold hands and say GAH! 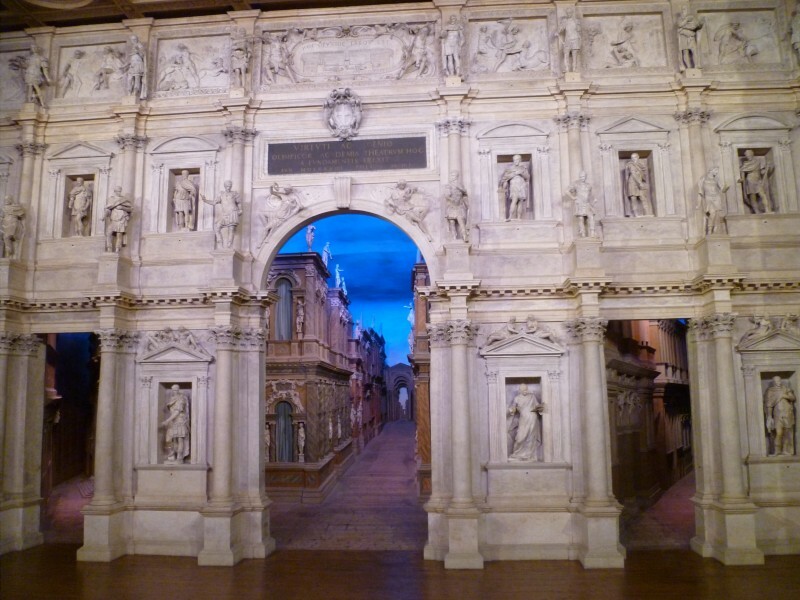 I’ve been meaning to write about visiting Teatro Olimpico in Vicenza, Italy in an academic way, letting you all know that it was constructed in 1580 from Andrea Palladio’s plans based on a reconstruction of an ancient Roman theater ,etc, etc, because you, my readers, need the facts. But I’ve got to be straight with you: as soon as HOB and I walked up into the seats of the Teatro we were transformed into Mötley Crüe fans from my high school circa 1986. THAT’S SO AWESOME and COOOOOOOL where among our brighter observations. Picture this, Andrea Palladio, a high Renaissance humanist of the coolest kind, made a career of re-discovering classic architecture through the writings of Vitruvius, and changed the course of architectural history with his book I quattro libri dell’architettura. At the end of his life, he designed the first freestanding theater since classical antiquity. 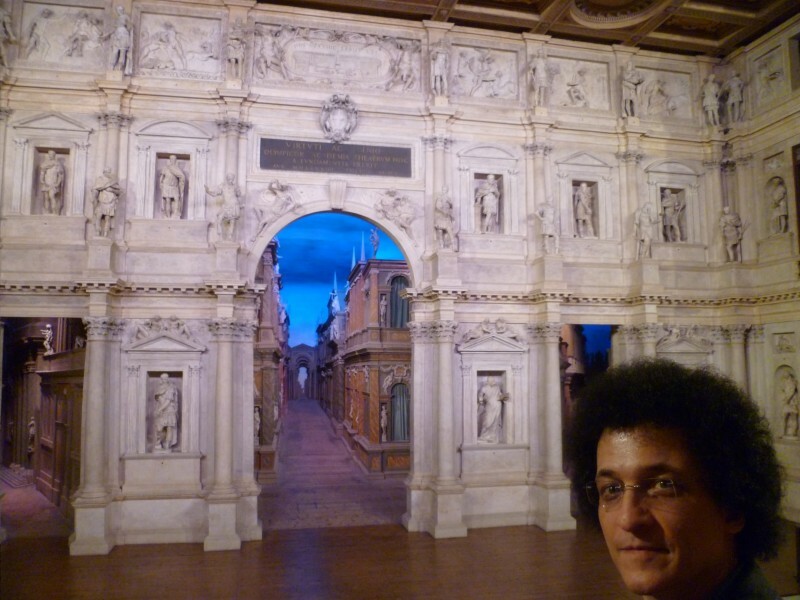 After his death, the theater’s onstage scenery, designed by Vincenzo Scamozzi, was permanently installed on the stage. The stage design is a trompe-l’œil perspective that Scamozzi intended to represent the seven streets of the ancient Greek city of Thebes. The illusion is just so sweet: the main street of the set is only 40 feet long, but seems to go off into a great distance. Scamozzi tricks the eye by have the floor rise, the sky descend and the statue-adorned buildings become smaller and smaller towards the back of the stage. Not only is the Teatro Olimpico the oldest indoor theater in the world, but it is still an active venue: it maintains a schedule of music and theater performances. 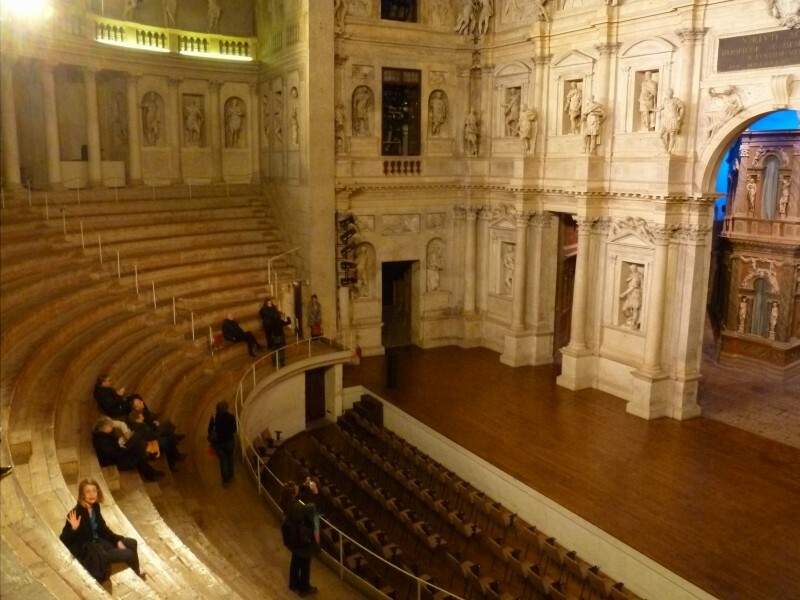 Let’s shake on it now—we’ll be back in Vicenza some day to watch a show in the Teatro Olimpico. And it’s going to be SO AWESOME.